Pine Creek - Pine Creek is seen on the lower sections of the Zion Switchbacks. Hikers can follow the stream by boulder hopping and making their way through the water. Pine Creek Canyon - Pine Creek Canyon is one of the most popular technical slot canyons in Zion National Park. 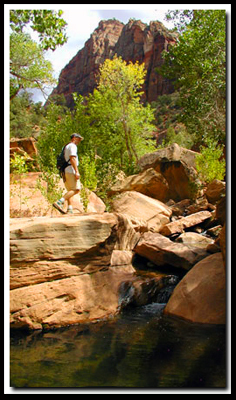 Pine Creek Canyon is entered just a short distance from the Zion-Mt. Carmel HIghway and compared to other canyons in Zion, it has an easy entrance and exit. This is a technical canyon and only those with technical canyoneering skills should attempt it. A Zion backcountry permit is required for this canyon. Pine Creek Waterfall - This is a short route, just off the Zion-Mt. Carmel Highway, along Pine Creek to a delightful waterfall and sandy pool. This route is only .25 miles long but it requires some boulder hopping. Upper Pine Creek - This route is the gateway to Spry Canyon and the exit to the East Temple route. Shelf Canyon - This mile long route, just south of Upper Pine Creek, involves some slickrock scrambling. This section is accessed near the east side of the Zion-Mt. Carmel Highway. The route takes about two hours to complete. There are fun narrows, ferns, hoodoos and sandstone patterns in this secluded little spot.